What Is A SSA-827 Form? This document is required by the Social Security Administration to determine whether the applicant is disabled. The medical and other information is necessary to be provided to the success of the disability programs. 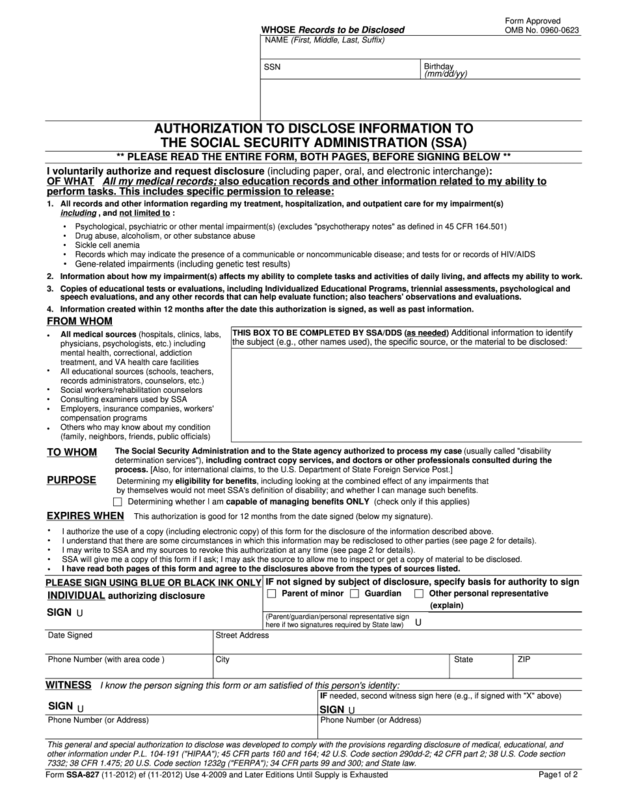 If you intend to authorize the disclosure to the local authorities in order to apply for benefits, you should complete this SSA-827 form. It serves as a part of the disability application. No matter, whether you are an adult or you want to report about childhood ailment. This form may be used to as a written request of the claimant to a medical or another source to release information about infirmary. This way an individual may get an authorization for the claimant’s sources to provide information to the Social Security Administration. The sources include hospitals, doctors, schools, nurses, psychiatric workers, employers, friends, and family members. Before signing check the document for mistakes and ensure, that every field is completed. It is possible to personalize the document using editing tools and send to sign it electronically. You can export your file in PDF to any other format if needed. Save it and print to have a paper copy.